and trying to help out with end of the school year activities for my kids. My kids only have 6 days of school left so I am REALLY thinking about SUMMER! and it has continued to be a popular choice for my kids year round. Eight years ago today we moved into this house. My son and I knew no one and were bored...very bored. 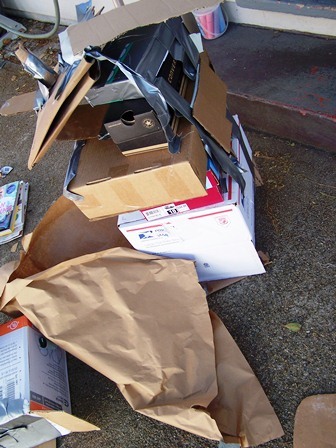 I used our moving boxes to make houses, dump trucks, and rocket ships. The rocket ship actually survived for 3 years! 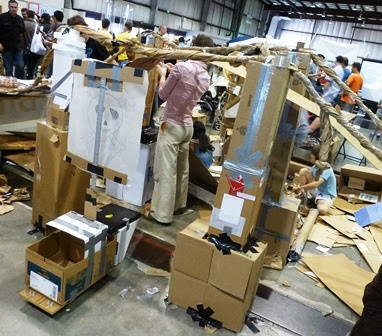 Until my memory was jogged when I was at the Maker Faire with Delta Faucet. 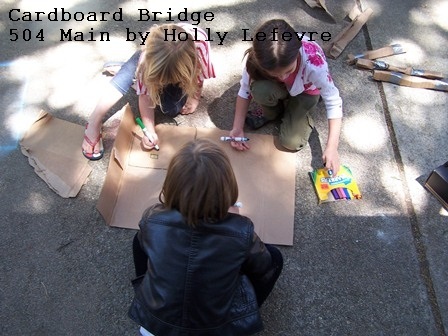 We came across the Berkeley Institute of Design's Crowd-Powered Bridge Design and Research Project. I was reminded of the rockets ship and thought this would make a fun summer activity for my kids and their friends. 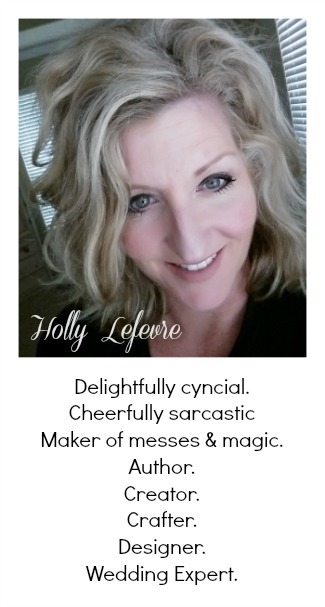 and thought, let's give this a shot! younger kids ranging from 5 to 8 year old. At first they seemed hesitant, but ready to give it a go. 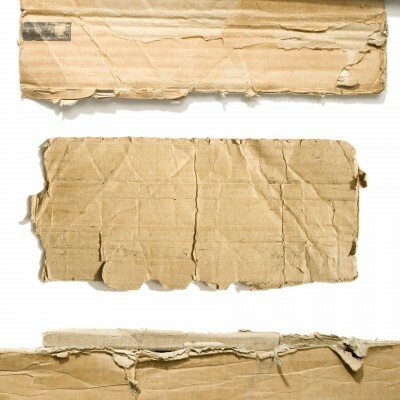 taping, ripping, and building with cardboard for a couple of hours. that was more important to the little ones. 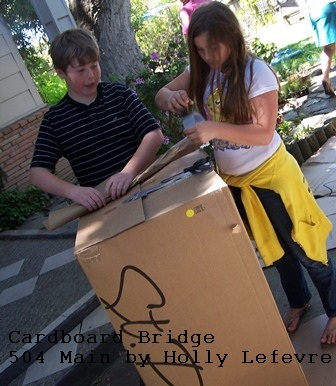 to make your own bridge/ramp/contraption! 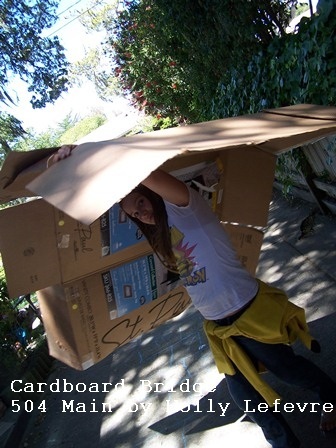 Cardboard: boxes, shoe boxes, poster board, craft paper - whatever you have around! I picked up a few rolls of kraft/shipping paper at the dollar store just in case. Suggested they collaborate first and draw a picture so each kid could visualize the end goal. I think this helps the kids combine forces more easily. 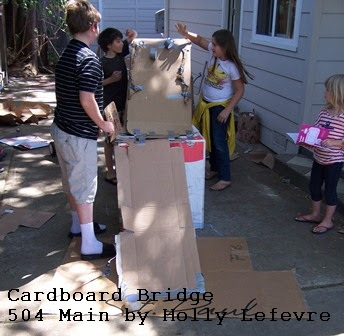 Explain to them they are to work together to create a bridge or tower or whatever you want using only the cardboard and tape. At the Maker Faire the goal was to get a small toy car to roll over the bridge and for it to be high enough for a toy cardboard boat to go under the bridge. Our goal was that Jules could ride her trike under it. Give them each a roll of tape. Then turn them loose....it took a bit for them to start clicking...but then they did and worked together to build this bridge (or ramp). Well, my visions of a grand bridge did not quite materialize. 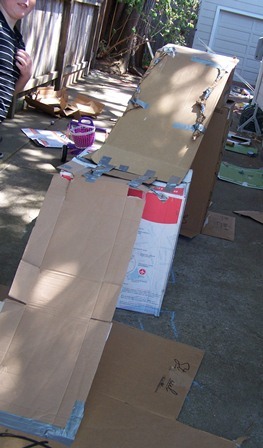 The kids bridge looked like a ramp. They proceeded to launch the empty rolls of tape and Hot Wheels cars and Zoobles off of it. The Trike did fit under it...but most importantly, they had fun in the sun for hours and worked together to get a finished project. 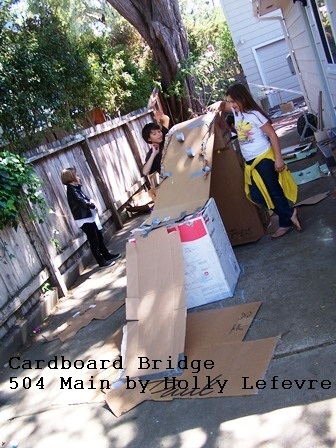 The little kids also created a smaller version of a "bridge"
(or something!) and enjoyed it too. everyday recyclables and things laying around the house and provide hours of fun and teach the kiddos a little something this summer! now, that is a winner idea in my book! Do you have any simple, cheap, and easy idea for summer?